It happens every year. The weather gets colder. The holidays come. We spend more time going out, eating poorly, drinking alcohol, and sleeping less. Our healthy habits fall by the wayside. And then, we get sick. From a holistic health perspective, its not at all surprising. Of course if we don't rest, eat crappy, and drink a lot, we get sick. When we aren't supporting our bodies and especially our immune system, it just can't do its job effectively. I don't know about you, but I hate being sick. Admittedly, I turn into a big, grumpy, whiny baby. Luckily for everyone around me, it hardly ever happens. I don't mean to brag, I just usually manage to avoid the winter colds, flus and various bugs that often take down the people around me. Sure it happens occasionally, but honestly it's pretty rare, and I can't remember the last time I was sick for more than a few days or had to miss work because of it. I'm not telling you this to be self-righteous or make you feel bad if you do tend to get sick often. I'm only telling you this to let you know that the right diet and lifestyle choices can HUGELY improve your immune system, lessening the amount and severity of illness in your life. With so many people getting sick this winter, I wanted to share some simple preventative strategies for supporting immunity on a daily basis. If you do find yourself getting sick, amp up the suggestions on the list. There are also a number of herbs and supplements that can help shorten the duration and severity of your cold or flu, feel free to contact me for more information on those infection fighting super boosters too! Eat colorful plant foods. Eating a variety of colors also means you're getting a variety of vitamins, minerals, and phytonutrients (compounds that act as antioxidants to protect our cells) to keep the body healthy. Focus on eating fruit, vegetables, nuts, seeds, herbs and spices every day. Challenge yourself to get as many colors as you can on your plate in each meal from real, whole foods. Vitamin C protects against free radical damage and is well documented in its protection against the common cold. Broccoli, papaya, kiwi, bell peppers and strawberries are all extremely high in Vitamin C. Vitamin C is not stored in the body, so it is important to replenish it through the diet on a daily basis. Carotenes, the form of Vitamin A found in plants like sweet potatoes, carrots, kale and spinach, play an important role in protecting against unwanted pathogens. Animal sources of vitamin A are referred to as retinoids, and include eggs, yogurt and salmon. Despite Vitamin E being a potent antioxidant, most of the population fails to meet even the minimum recommended amount. Actually a name for 8 different nutrients, sources of vitamin E include almonds, avocado, sunflower seeds, spinach and swiss chard. Sources of selenium include Brazil nuts, sardines, crimini mushrooms, asparagus and organic tofu. We don't require a lot of selenium (RDA is 55 mcg for adults), so you don't need eat a large amount of these foods if they are in your diet regularly. Foods high in zinc include pumpkin and sesame seeds, lentils, shitake mushrooms and spinach. Zinc is hugely important for a healthy immune system, as well as hundreds of other actions in the body, and can be helpful to take as a supplement if you do feel a cold coming on. Immunity booster super foods: Some foods just pack a big healthy punch in a small package. These include lemons, ginger, turmeric & garlic. Sure its great to take these as an immunity shot from your favorite juice bar when you feel a cold coming on, but having them in your diet on a regular basis is even better. They provide antioxidants, fight inflammation, are antibacterial, anti-fungal, and have powerful immune boosting properties. 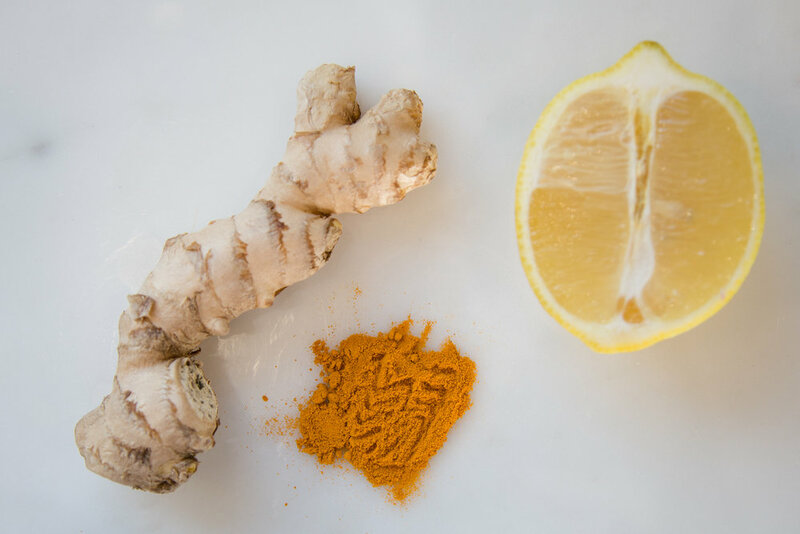 Make a fresh lemon ginger tea, add some turmeric to your tomato sauce, eggs, and curries, and add an extra clove of garlic to your salad dressing, pesto or sauteed veggies. Essential fatty acids: Healthy fats like omega 3 fatty acids help to reduce inflammation in the body. Inflammation is the body's defense system response to a perceived harmful stimulus. In small doses, it is necessary and helpful. But chronic inflammation can contribute to disease, and can sometimes be misdirected. Foods like flax, hemp & chia seeds, walnuts, sustainable cold water fish like salmon or sardines, or spirulina are important sources of omega 3's. Without enough water, the body struggles to continually flush out toxins, making it harder to fight infections. When we don't drink enough water we often feel tired and headachy, which might affect our sleep or desire to exercise, two things that on their own also impact our immunity. Most people don't drink enough water, and really notice an improvement in how they feel when the drink adequate amounts. It's usually the first recommendation I make to clients, and luckily its simple, easy and free. In fact, take a second right now to get a glass of water! Drink at least half your weight in oz. of water every day, plus an extra glass for every half hour of exercise, or in warm weather. Adding lemon to the water helps absorption and adds extra vitamin C.
Drinks with caffeine and alcohol dehydrate the body, so avoid those if possible, and if you do have either one, compensate by matching it with an extra glass of water. Other recommended beverages include herbal and green tea, fresh fruit and vegetable juices, and broths. Did you know that an estimated 70 % of your immune system lies in your gut? Think about all the foreign matter (food) your digestive system has to sort through every day, determining what is nourishment for your cells, and what is an antigen (a foreign substance that triggers an immune reaction) like bacteria or viruses. Simply put, if our digestive system is weak or out of balance, our immune system is compromised. Eating fermented foods provides your gut with healthy bacteria, necessary for immune function, digestion, vitamin synthesis and so many other essential processes in the body. When the "good" bacteria in our gut are reduced, the "bad" bacteria can overgrow, leading to infection, skin disorders, headaches and even depression. Boost the healthy bacteria with foods like whole fat, unsweetened yogurt, kefir, kimchi, sauerkraut, kombucha (watch the serving size and amount of sugar - see below) miso and tempeh. If you can't eat these foods regularly, it may be worth taking a probiotic supplement to correct any imbalances. Enhance your digestion: Too much or too little stomach acid, altered pH and intestinal permeability can all compromise digestion and absorption of nutrients. The use of medications, alcohol, stress and even age can all hinder digestive health, and therefore affect your immune system. If you experience bloating, indigestion, stomach aches, or numerous food intolerances, I recommend speaking to a health practitioner. If you suspect your digestion is not as efficient as it could be, shoot me a message and I'd be happy to make some specific suggestions. Sugar: In addition to the roller coaster ride sugar takes with our energy levels, excess amounts of sugar can inhibit the immune system. It takes nutrient reserves from the body to metabolize sugar, yet provides zero nutrients back to you. Even if you don't think you eat a lot of sweets, consider all the hidden sugar and refined flour hidden in your food. If you eat bread, pasta, crackers, baked goods, pre-made sauces and condiments, commercial yogurt, sports drinks or bottled juices regularly, chances are you're consuming unhealthy amounts of sugar. Start taking a look at your labels and skip anything that has more than 10 grams of sugar per serving. Any food you're allergic or sensitive to: Very few people have really severe allergic reactions to food, such as hives or finding it difficult to breathe. Usually the reactions are much more mild and subtle, but are still triggering an inflammatory response. For example if you get heartburn when you eat pizza, or a stomach ache after eating dairy, I highly recommend avoiding those foods. Even though you may think of these minor symptoms just as an inconvenience, they are signs that your body is not able to digest, metabolize and assimilate that food, which leads to inflammation, an immune system defense. Ignoring those signs only continues to tie up your immune system, taking it away from its real job of keeping actual germs at bay. Sleep more: Second to our diet, sleep probably has the biggest effect on our immune system. People who do not get enough quality sleep are more likely to get sick, and may have more trouble recovering from sickness. Most adults should aim for 7-8 hours a night. Stress less: Stress increases cortisol, which suppresses the immune system. Try to schedule in stress reduction techniques into your day, such as meditation, yoga, walking outside, or even a bubble bath. A massage is not only a great way to increase relaxation, but also stimulates the lymph system, an important part of our immunity! Be conscious of your thoughts, and do your best to take deep breaths when you start to feel overwhelmed. Exercise (moderately): Most of us know that one of the benefits of exercise is a that its good for the immune system. But overdoing the workouts can actually have the opposite effect, stressing out your body and decreasing your immunity. Moderate exercise on a regular basis is the best for your immune system, bonus points if its outside and if you actually enjoy it! Sunlight: Many people don't produce enough Vitamin D. This nutrient is really more like a hormone, our body produces it with the help of sunlight, and can modulate our immune system. Try to get outside and get some direct sunlight on your skin (without sunscreen) for about 15 minutes a day. Sometimes despite our best efforts, we still get sick. It's just a part of life. If you've done all you can, take it as a cue to bundle up, relax in bed with a cup of tea, binge watch trashy TV and chill out. Give yourself a break from your endless to-do list, and take a few days off to give your body the rest it needs. If you feel like you catch every cold that goes around, or you tend to get sick more often than others, there might be something more serious going on. For chronic infections I recommend seeing your doctor for testing, and learning more about how modifying your diet may be able to improve your health long term. I'm here to help if you want to chat, I always offer a free phone consultation to talk about how I can best support your health! Oh man, the holiday season is almost here! Are you ready? Ugly sweater parties, cookies, cocktails, office parties, dinners, shopping, family parties, baking, wine, and did I mention parties? Many of us have a love/hate relationship with this time of year. It's great getting together with friends and family to celebrate, but it can also be really stressful, physically exhausting and emotionally draining. For those of us that are trying to eat healthy, it can seem almost impossible to stay on track. I hear people say things like, "Well I'm giving up now, but I'll get back on track after Christmas", or "There's too much going on, I can't commit to eating well until after the New Year". It doesn't have to be like that - why let the holidays derail you and your health? Going crazy with indulgences one month will only make it harder to change the next. Wouldn't you prefer to feel energized, looking and feeling great throughout the holidays, rather than falling into bad habits, fighting fatigue and gaining 5 pounds in cookie weight by the time New Year's Eve rolls around? Eating well and taking care of yourself will also keep your immune system strong, helping to avoid those winter colds and flu that often go around at this time of year. So give yourself the gift of health this holiday season (sorry, couldn't resist the cheesiness) and end 2017 feeling good! OK, I know you want to stay up all night partying with your friends, but sleep is really a lifesaver. Without sufficient sleep, our hormones become imbalanced, leading to an increase in appetite, stress and even depression. The last things we need more of during the holidays, right? The next day we turn to caffeine and sugar to keep up our energy, which throws off our blood sugar regulation, and the vicious cycle of sleep deprivation and stimulants often continues. Personally, exercise often goes out the window if I'm tired, I'm way less likely to make that morning yoga class if I didn't get enough sleep the night before. Commit to getting at least 6 hours of sleep a night, even if it means leaving a little bit earlier than others, or not scheduling anything early the next morning. And on the nights you can get more, sleep up to 8. If you feel like you need a nap, aim for either 20 minutes, or 90 minutes to avoid waking in the middle of a sleep cycle, which could leave you feeling even more groggy. Of course, check with the host first, but most people are happy for you to contribute food to their event. That way, you know you have at least one healthy option. I usually bring a big seasonal salad, maybe with roasted veggies or quinoa to make it more filling. Or maybe its a gluten free or low-sugar banana bread for a healthier desert option. If it's not an event you're able to bring food to, don't despair. Just eat a small amount of healthy food before you go. Having a small bowl of veggie soup, a salad, or a hard-boiled egg beforehand means you're way less likely to over eat the unhealthy party food options. Let's be honest, you're not eating party food and drinking cocktails for every meal this month. So for all those meals you do have control over, choose extra healthy options! Load up on veggies of all colors, healthy fats like avocado and raw nuts and seeds, and clean protein. Avoid packaged and processed food. Maybe even take a probiotic or multi-vitamin. Do not let Sunday's cookie exchange extravaganza be an excuse to eat crap all day Monday. Get back into your healthy eating groove right away, and take advantage of all the times you do have healthy options. Cooking meals at home is the best way to ensure you're getting the healthiest ingredients. If you're looking for convenient ideas, check out this information on meal prepping. Most of you are probably saying, "Ha, yeah right". I know it's the holidays, and booze is everywhere. Aside from the dangers of excess alcohol consumption, drinking negatively affects our sleep and appetite, so the effects last longer than just that one party. Imagine how you'd feel this month without any hangovers? Amazing, right? So my suggestion is simply to drink less alcohol and drink more water. After every glass of alcohol (wine, beer, spirits, whatever), have a glass of water. This will keep you hydrated, reduce hangovers, and ultimately reduce your total alcohol consumption. Instead of spending the day post-party on the couch eating potato chips, you'll have the energy to stick to your exercise routine, be productive and make healthy food choices. Let's be real, you're going to have some less than healthy food this season. And that's OK! Just don't overdo it. Be selective about what you choose, indulging in the things you really want, not just the things that happen to be in front of you. Cut yourself a small piece of pie. Try the best looking cookie, not all of them. Remember you don't have to eat everything on your plate. You'll feel a lot happier if you allow yourself to have just a little bit of the "bad" stuff instead of completely missing out. Exercise reduces stress, increases our good mood hormones, and helps us avoid gaining extra holiday weight. As your calendar fills up with parties and events this season, be sure to schedule in time to exercise as well. Maybe take that friend who's in town visiting to a workout class with you instead of going to the bar? Or suggest a walk or hike with your family, instead of another dinner? As things get busy, commit to making time for this, otherwise it probably won't happen. This really holds true of all types of self care - make sure you're saving a little time for yourself, to do whatever it is that recharges your batteries. It's totally normal for the holidays to bring up feelings of loneliness or depression, so practices like journaling or meditation can be really helpful. If you're feeling depleted or overwhelmed give yourself permission to decline an invitation and spend a quiet evening drinking tea and taking a bath. I hope you find this list helpful and realistic, so you can set attainable goals this holiday season. Try these suggestions out and let me know how it goes! If you've got a specific challenge coming up, or a question about your health, shoot me a message, I'd love to help!